Have you ever dreamed of seeing your name in big lights on Broadway?? Here is your big break!! 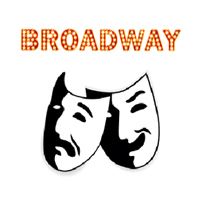 Join us for a full week of training to be the next Broadway Star!! Dancers will learn how to prepare and perform songs, recite monologues, and perform the original choreography of some of the Musical Theater world’s most famous productions. With singing, acting, and, of course, dancing galore, this camp is sure to please any of those striving to be a triple threat! By the end of the week, our Broadway Stars will razzle dazzle their adoring fans with a show worthy of a spot on Broadway! Form-fitting dance attire. Ballet & Tap Shoes and a pair of sneakers. Hair should be pulled back in a neat ponytail or bun.